Artist Thornton Oakley was born in Pittsburgh in 1881 to a wealth family. He left for Philadelphia, and studied architecture at the University of Pennsylvania. He also studied under the illustrator Howard Pyle. Anne Madarasz, Museum Division Director at the Senator John Heinz History Center says Oakley was continually drawn back to Pittsburgh over his lifetime. 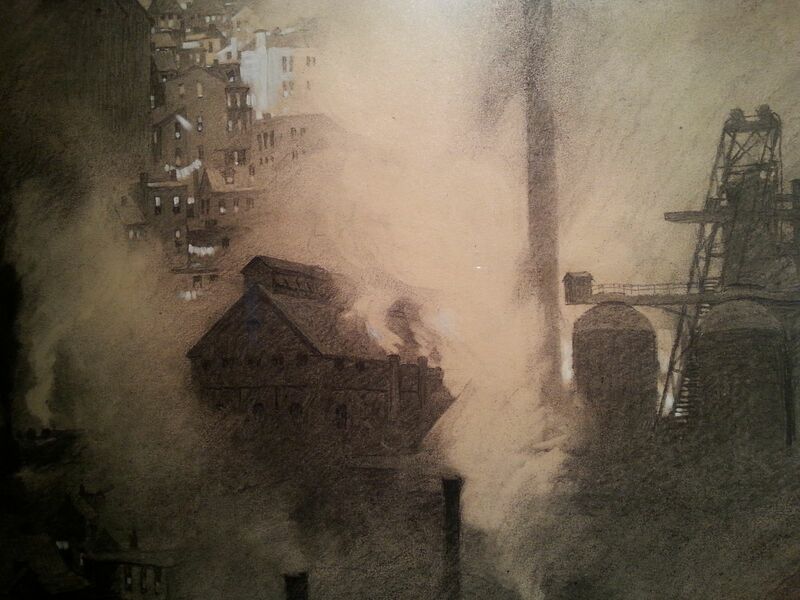 In 1913 he sketched Pittsburgh's smoky, industrial riverfront and rising Downtown area. The sketches became a series of 30 charcoal drawings which were shown in Pittsburgh in 1914. Six of those works are now on display at the Heinz History Center until March 22. We talked with Madarasz about the small collection, and the way Oakley viewed the city and its natural resources. Below are some of the highlights of Madarasz's insights from that conversation. 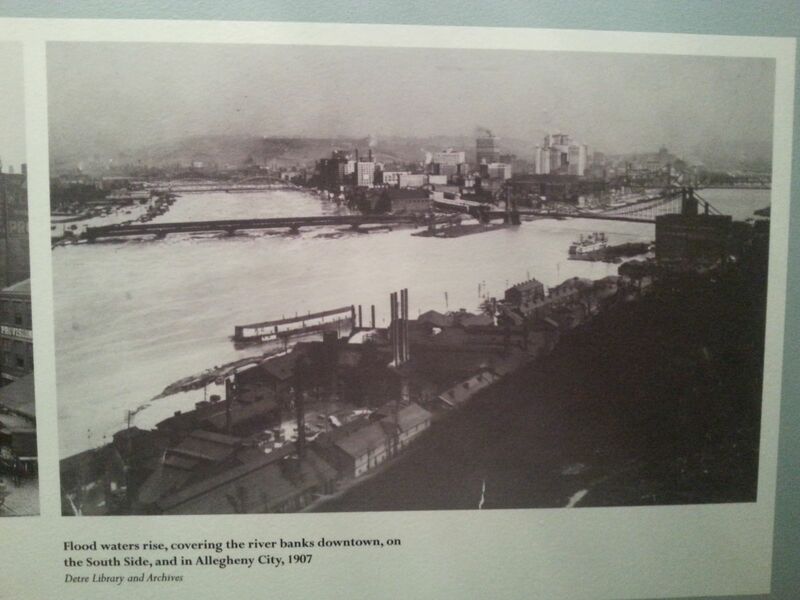 The riverfront at that point in Pittsburgh's history would have been just factories, cheek-to-jowl, all the way down along the river—iron, steel, glass factories, the few that were still left in the city. And then you look across the river—very much the working river that Pittsburgh was at that time—it's loaded with barges, kind of through a veil of smoke, through a bridge, and in the background you see this kind of white city rising in Downtown. And it's a really wonderful juxtaposition Pittsburgh's industrial past with it's new kind of corporate future. That's one of the beauties of the work that you'll see here, is his rendering of smoke and light, and the interplay between them, and the sense of a city kind of poised for change. That these man-made, kind of miracle of architecture are coexisting with these natural resources that really define our city today—the rivers, and the coal that fueled these furnaces. His paintings are really about sort of what man has wrought on the landscape, and the interplay between them. And almost in many senses an homage to man as actor on the environment. So he doesn't see the smoke, and the, what some would say the ugliness of industry as a negative. He uses a little bit of a wash on some of these to give it that effect...You do think of him being here in July, and the way the river can look when the light hits it, you know, when there's a hard midday sun. Though it's hard to believe when you look at these images that the sun ever made it through the smoke and the clouds. I think people are entranced by this sense of Pittsburgh yesterday and Pittsburgh today. And what the city looked like, and how it's changed over time. And yet how it's basic environmental features have stayed the same. We still are defined by our rivers, and by our hills. I think the way the smoke is handled in these images, it makes it very much a defining factor. We forget what that meant in terms of the fallout from it, you know, that pollution from it. What it meant to people who lived in the city, what it meant to the environment around the city. But it really is in a sense, I see Oakley tying in some of this work where he shows you this smoke, and this kind of backdrop of the city rising, this is what generates the wealth that creates the downtown that we know today. And has sustained this city, even 100 years later—the wealth that was created from that smoke. What would Oakley think of the view from Pittsburgh's Mount Washington today? I think he'd be captivated by the fact that the human force in Pittsburgh continues to interact with the environment, and to kind of create what we have today. It still very much shows the hand of man, even in its purity where we've cleaned it and scrubbed it and changed it. I think he'd be fascinated by that. And I think harnessing the river to create that fountain that you see there at the Point, I think he would love that interplay of water there. 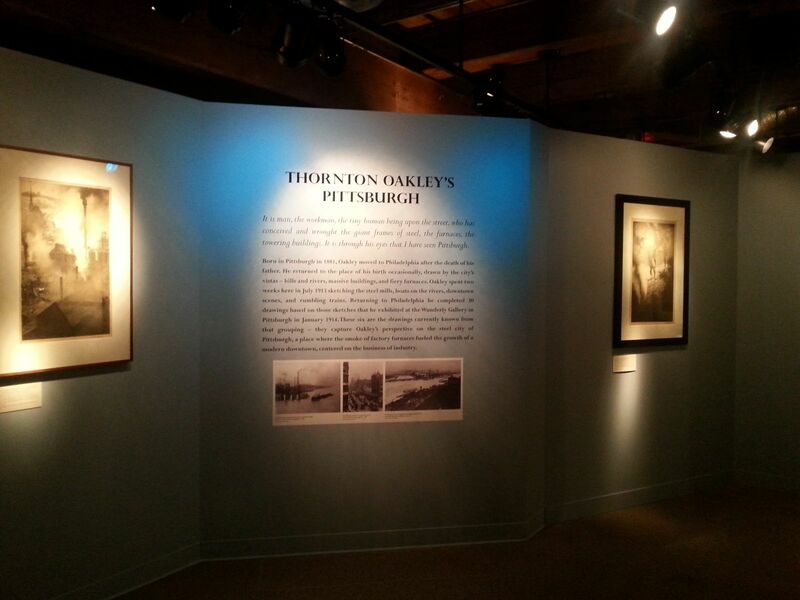 Photos by Kara Holsopple, top to bottom: Oakley exhibit space at Senator John Heinz History Center in Pittsburgh; Historical photographs of Pittsburgh's riverfronts are on display to give visitors a better perspective on Oakley's drawings; Close detail of Thornton Oakley's "Jones and Laughlin Mills, Soho."